It’s great having a best friend to do everything with–but not so great when they go away. 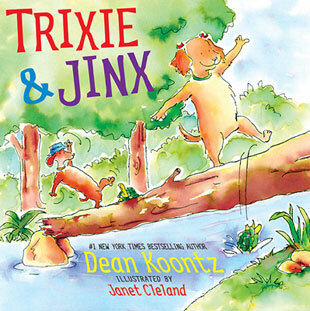 Trixie the golden retriever longs for her buddy Jinx the dachshund when Jinx goes on vacation. Lonely Trixie tries to find new friends, but discovers that spiders have no sense of humor and mice just can’t appreciate a good tail-chase. No one can compare to Jinx! Kids young and old will relate to bestselling author Dean Koontz’s funny story extolling all the wonderful things about best friends.